A 3-layer reduction wood cut. This animated Relief print illustrates a girl "individualizing" a kangaroo. It portrays overcoming the fear of being different from everyone else, to stand out of a crowd, & to be unique from a mass population. A 3-layer reduction wood cut. This animated relief print illustrates a girl helping her walrus friend who is stuck b/t two hill formations. It portrays overcoming the fear of being stuck or stranded by having a helping hand or friend. It could even ambiguously portray conquering claustrophobia. All prints were produced before the sculptures. A 3-layer reduction wood cut. 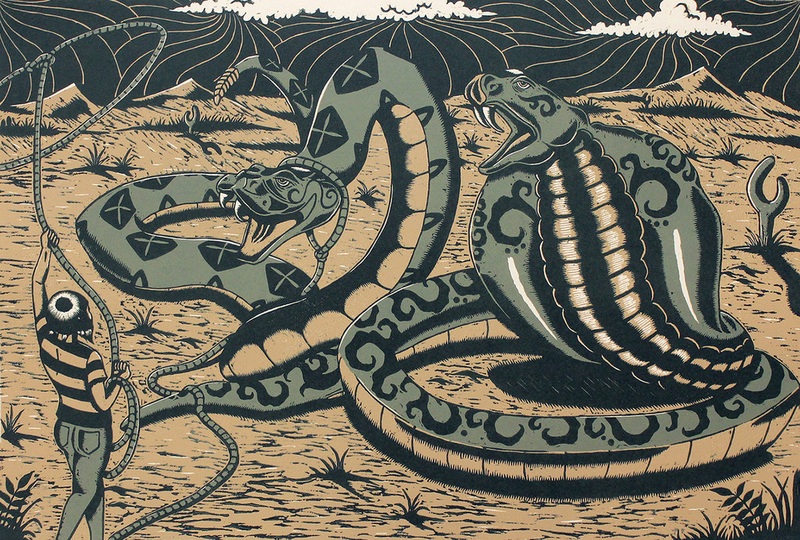 This relief print illustrates a fearless girl lassoing a giant rattlesnake and cobra in a desert environment. She is overcoming her ophidiophobia. A 3-layer reduction birch wood cut. This relief print illustrates a girl climbing a nonchalant giraffe, whom "boosts" her into an air balloon. This is a 4-layer reduction birch wood cut. It portrays a girl straddling & slaying a giant killer wasp in the air. Two slain wasps fall below them. She is confronting her spheksophobia, which happens to be one of my biggest fears. This is a 1-run color layer woodblock. This print was for a Mexican Student Print Exchange. I illustrated a few of the 3-dimensional "Freak Show" members & formed them into a versatile band. This is a 1-run Linoleum block printed on a letter press. It is an illustration of a science experiment-gone-wrong escapee, who appears to have elephant, bat, armadillo, etc...features. "Bevin" encounters his only friend, an elephant stag beetle, named "Toot."